Dan Scalo. I can’t recall when a HS athlete was such a pleasure to photograph. Both on and off the field. I’ve seen a lot of them play throughout my career, including athletes who’ve gone on to play at major colleges and even the pro ranks in various sports. This kid’s accomplishments on the football field were something to behold the past three years that I’ve been photographing him and the rest of the Monroe-Woodbury Crusaders. Before joining the staff here at the Times Herald-Record, I had no idea of the “mystique” of MW football and their previous trips to Syracuse for the HS State Championship. I would eventually wind up in the Syracuse Univeristy Dome the last two seasons myself, following MW’s consecutive runs at a state championship. All in all, this is a kid who brought it every week. I’m talking about a true “A-Game” player. Throughout last year and this past season he endured the effects of a surgically repaired throwing shoulder, but defenses just couldn’t handle his running ability. For the record, he ran for 1,569 yards & 20 TD’s and threw for 1,143 yards & 13 TD’s. 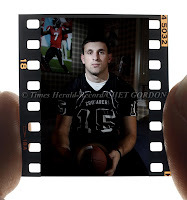 He was also named our paper’s Player of the Year (POY) in 2007. 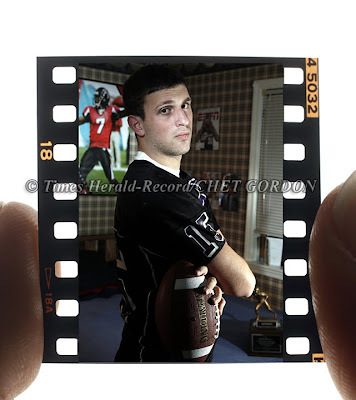 Our portrait session was made in his bedroom (not my idea) as I tried to incorporate a few props; a football, his Gatorade NY State Player of the Year trophy on the bed, and even put a third strobe on the Michael Vick poster in the background. Stripping the image into the 35mm film template held by my fingers was an additional idea I wanted to utilize, otherwise it might’ve just been a portrait of the kid in his bedroom… -cg. This entry was posted on Monday, December 21st, 2009 at 12:09 AM. It is filed under Uncategorized and tagged with football, high school, monroe-woodbury, portrait, POY, strobe, strobist. You can follow any responses to this entry through the RSS 2.0 feed.